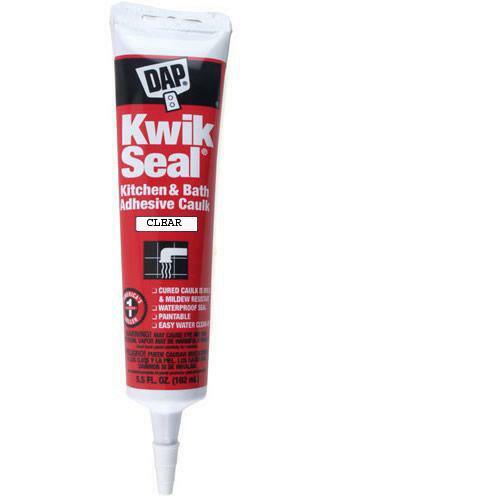 DAP KWIK SEAL ADHESIVE CAULK IS A WONDERFUL ADHESIVE. IT IS A SPECIAL SILICONIZED LATEX WHICH PROVIDES MAXIMUM ADHESION AND FLEXIBILITY FOR A WATERTIGHT SEAL. IT COMES OUT IN A THICK WHITE PASTE BUT DRIES CLEAR. I THINK IT HOLDS A BIT FIRMER THAN SILICONE FOR A GOOD GRIP. IT'S PAINTABLE AND CLEANS UP WITH WATER. NO SMELL!!! NOT FOR WATER IMMERSION PROJECTS SUCH AS BIRD BATHS. USE AS YOU WOULD SILICONE. I'VE SWITCHED COMPLETELY TO USING THIS PRODUCT FOR ALL MY SAMPLEBOARDS INSTEAD OF SILICONE AS IT DRIES MUCH FASTER.